On the surface, Moana is about a reluctant chief-in-training who struggles to rectify the expectations of her people with her own wants and dreams. Chief Tiu (Moana’s father) believes that no good can come from ever leaving their island paradise. Even when vital resources begin dwindling, Tiu remains firm in his convictions that all boats are evil, and while preserving his uncomfortable adoration of coconuts. Nevertheless, Moana embarks on an epic voyage to save Motunui, and does so with one of the very boats that enrage her father so. Thus, Moana restores life to her island and reinstates her people’s previous livelihood of voyaging the open seas. Moana’s right-hand man throughout her journey is the demigod Maui. And he is awesome. The Rock totally delivers, and his performance is one of the highlights of the film. The problem with Maui – arguably the only problem with Maui – is that he is completely unnecessary. SPOILERS AHEAD. Maui steals the heart of the goddess TeFiti, a rock with the power to create life that is vital to sustaining life on Motunui and the surrounding islands. Yeah, I don’t really get how it works either, but that’s neither here nor there. This vandalism upsets the natural balance, putting Moana’s home in danger of becoming the next causality. According to Grandma Tala, the only way to stop this systematic destruction is to retrieve Maui from his banishment so that he can restore the heart to the goddess. As the circumstances play out, though, Moana restores the heart all by her onesies. Yet, the majority of the film is spent locating Maui, convincing him to help, apprehending his missing fishhook, and helping him to overcome a variety of personal insecurities. Sure, he tries to help along the way, but upon discovering that Te ka the lava monster is actually just a royally PMSing TeFiti, Moana is easily able to diffuse the situation. I can actually relate to Te ka a lot right now. Except my fiery rage is paired with chocolate. Cool. Another girl power Disney flick determined to upset their legacy of less-than-impressive heroines, right? Well, yes. But there is a little more to it than that. It’s really weird that Maui is such a big part of Moana, but he doesn’t really contribute anything. After all, the guy’s built like an ox and just so happens to be a shape-shifting demigod. Maui’s utter uselessness makes no sense, unless . . . get ready for it . . . Maui only exists in Moana’s mind. I know, I know, Just hear me out, ok? Maui is the physical manifestation of the part of Moana that she has been forced to suppress, as he embodies key aspects of her personality and culture. For starters, Moana has been exposed to stories of Maui and his exploits since before she could even talk. Maui is apparently one of Grandma Tala’s favorite conversational topics. Coincidentally, Tala is the only person in Moana’s life to encourage her need to be on the ocean. Tala sings that her granddaughter must not ignore what she feels: “And when that voice starts to whisper / To follow the farthest star/ Moana that voice inside is who you are” (“Where You Are”). The “farthest star” sounds an awful lot like that last star in the fishhook constellation. You know, the constellation that leads to the exact island where Maui has been stuck for the past 1000 years? Yeah, that one. So if the “voice inside” is telling her to go to the “farthest star,” that voice inside might just be Maui. Or she named him Maui to feel better about talking to herself all the time. Regardless, once Moana reaches Maui Isle, she is away from Motunui and is fully on her own. She needs inner strength – or, if you will – inner Maui. Aladdin does it with an apple. This is the only GIF I could find to demonstrate what the heck I’m talking about. Of course, why Chief Tui and Maui replicate this Aladdin-patented move is an analysis for another day. This deliberate correspondence only furthers Maui’s role as Moana’s inner voice. She cannot escape her father’s insistence that she stay trapped on Motunui. In “How Far I’ll Go,” Moana laments: “I can lead with pride I can make us strong / I’ll be satisfied if I play along / But a voice inside sings a different song / What is wrong with me?” There’s that voice inside again, voicing Moana’s fear that in accepting her role as chief, she will only be playing a part and denying her true self. She finally succeeds in leaving Motunui and locating Maui. Then, with the chuck of a coconut, he traps Moana on his island. But she proves that nagging interior doubt wrong by ultimately escaping and rejoining Maui. This victory is pivotal; not only does she abscond the cave, but she also sways Maui’s opinion regarding her quest. This is later reflected in the film’s conclusion when Chief Tui finally embraces the sea. Moana is clearly oblivious to the fact that Maui does not actually exist. As far as she is concerned – and as viewers are concerned, for that matter – she is actually travelling with a demigod. You see where I’m going with this. Think Life of Pi meets A Beautiful Mind. Maui is basically Russell Crowe’s roommate. 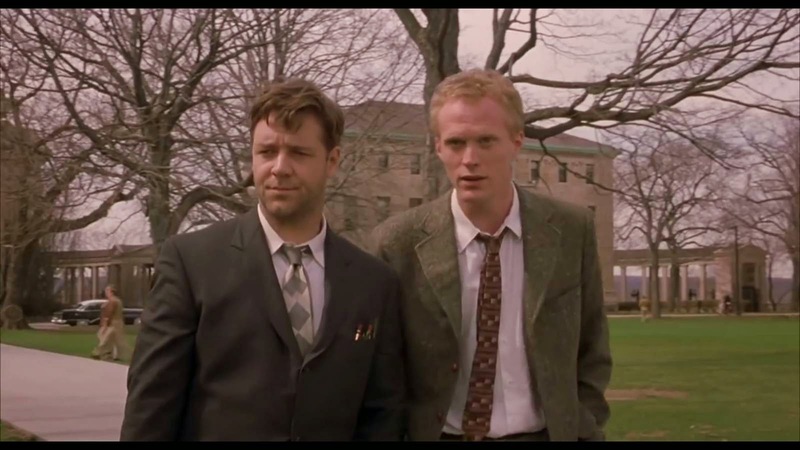 If you haven’t seen the film – and if this is the case, shame on you – Crowe’s John Nash heads off to university and meets his wonderful new roommate, Charles, and the two maintain a close bond throughout college and beyond. Until Nash is diagnosed as schizophrenic. He hears things that aren’t there. And sees people that don’t exist. And one of those people is that oh-so-loveable roommate. It is a mind-blowing moment in a damn good movie. Through some complicated technological methods, I edited this image to emphasize my point. I don’t think Moana is schizophrenic, but there are similarities between her interactions with Maui and Nash’s with Charles the roommate. For instance, there is no one to verify that Moana and Maui ever hung out, let alone saved the world together. I mean, unless one would count the legendary creatures that Moana defeats along the way, but the only person to see those guys and to make it back to Motunui to tell the tale is Moana. Grandma Tala witnesses the ocean interacting with her granddaughter, but Tala is also the village crazy lady. And dead. Both of which work against her credibility. While these exchanges with the demigod are reminiscent of A Beautiful Mind, the reasoning behind having an imaginary sidekick is closer to that behind Pi Patel’s hallucinations. While the conclusion of Life of Pi is arguably ambiguous, I’m of the camp that Pi’s lifeboat was actually not full of circus animals. However, that was the reality that Pi’s mind generated in order for him to survive that ordeal. Similarly, Moana is alone at sea for a long time. It makes sense that her mind would conjure up this familiar companion to help see her through her journey. If Maui is himself a projection of the internal Moana, it stands to reason that at least portions of the voyage depict her interior battles. This notion is furthered by the types of villains that she and Maui encounter along the way. After retrieving Maui – or shall I call you CHARLES THE ROOMMATE – the first obstacle they meet is a violent tribe of bloodthirsty coconuts called the kakamora. Yeah. Like hundreds of evil little coconuts on these floating warships. Coincidentally, one of the big problems for Moana’s island home is that the coconuts, their main resource, were rotting from the inside out. There’s an entire verse of “Where You Are” dedicated to coconuts, and Tui is super psyched to sing about them. Seriously. The look on his face is one of pure joy. Pictures of Tui are hard to come by, but these villagers are equally pumped regarding the existence of coconuts. So Motunui’s coconuts go bad. And then Moana has to defeat bad coconuts. And while Maui displays some stealthy techniques with steering the canoe, it is Moana who reclaims TeFiti’s heart from the kakamora. Next, Maui teaches Moana how to sail as they travel to the lair of Tamatoa, the greatest character with the greatest song in the entire movie. There is very limited merchandise available pertaining to Tamatoa. I can’t be the only person lamenting this fact, can I? This is entirely unrelated to my argument, I just felt that someone needed to be aware of the problem. Seriously – this is the best GIF I could find. For Tamatoa. The David Bowie crab. Come on, where’s the love? Anyway, this gigantic, human-hungry crustacean is obsessed with his physical appearance. He loves all things sparkly, and advises Moana that she should do the same: “Did your granny say ‘listen to your heart/Be who you are on the inside’? / I need three words to tear her argument apart: / ‘Your granny lied’!” (“Shiny”). Tala is Moana’s only source of support regarding her love of the ocean, so it makes since that at some point, Moana may doubt herself and her mission. This doubt is personified (…crabified?) in the bedazzled Tamatoa. If one looks attractive and is “shiny” enough, he or she will be admired. Remember “How Far I’ll Go,” and the lyric “I’ll be satisfied if I play along” – Tamatoa wholeheartedly agrees . He tells Moana that “fish are dumb, dumb, dumb / They chase anything that glitters – beginners / And here they come, come, come to the brightest thing that glitters.” Play the part and people will follow. Moana is a reluctant chief, but perhaps she should just go back and lead her people through a glittery façade. And of course there’s the whole reason that they go to see Tamatoa in the first place, which is to retrieve Maui’s fishhook. Maui tries repeatedly to obtain it, but in the end, Moana who tricks the crab and gets the hook. At some point somewhere within the realm of Moana, Maui probably did exist. In the film’s introduction, Tala tells of how TeFiti’s heart came to be stolen and how many monsters were eager to get their hands on this powerful stone. Pictured are the kakamora, Tamatoa, and of course, Maui. Moana was raised with these legends, so they obviously factor prominently into who she is. The larger than life persona of Maui is that of a fearless and essentially benevolent demigod, and this is the guy that Moana needs to get her through a very scary, very solitary journey. The chicken just didn’t cut it. Her people all know the legend of Maui, and that’s why he plays so prominently into her story. Moana not only aligns herself with one of the most recognized (albeit fallen) heroes of Motunui culture, but she also restores him to his former glory. Inspired by the tales from the “village crazy lady,” Moana crafts an intricate fiction, casting herself as the heroine. This will strengthen her persona and the surrounding mythos when she leads as chief. After all, Tamatoa does have a point. It’s important to “be who you are on the inside,” but a leader needs to look the part as well. And that’s what can be achieved with the story that Moana has to tell, and will undoubtedly be told about her. Her people are afraid of the sea, but Moana knows that they must at least occasionally leave to keep the island afloat, so to speak. Her entire island is against ever leaving Motunui for the entirety of the movie. However, the second Moana triumphantly returns, these same people are dragging the canoes out of storage and ready to voyage on the high seas, the coconut-loving chief included. Moana’s story deeply resonates with all of them, which ultimately gets her exactly what she wanted – for both herself and her people. I don’t want to say that Moana outright lies in order to manipulate her people into capitulation…but Moana outright lies in order to manipulate her people into capitulation. Or it’s all in her head. You decide. You’re welcome. *A very special thank you to my Bestie for her encouragement and mad proofreading skills, and to Steve for being my sounding board for the last two months.